“The Alexandrite” by Rick Lenz is a fascinating novel about time travel, old Hollywood, and one man’s journey to find himself. Jack Cade is 40 years old and having a rough time of life. He was fired from a non-paying production of Hamlet, his career is in shambles, and his wife just left him. Jack’s life is about to change dramatically, in ways no one would ever imagine, and it begins with a pawn ticket he receives in the mail. An alexandrite ring is on the other side of that claim ticket and Jack has no idea who sent it to him. Shortly after coming into ownership of the ring, a mysterious woman asks him to meet her at an old mansion in the San Fernando Valley. With nothing better to do, and nothing to lose, Jack goes to the mansion and meets with the woman, a psychophysicist, and is quickly drawn into a world of magic and time travel. He agrees to travel back in time to 1956 to help solve the murder of Richard Blake, a gemologist, and former owner of the mansion. Through a series of somewhat tumultuous events, Jack meets Marilyn Monroe, and he is killed more than once for his troubles. The alexandrite ring seems to be the catalyst driving the events and Jack soon wonders if he will ever find the answers he seeks. I have to say, “The Alexandrite” is a bit reminiscent of the movie “Groundhog Day,” as Jack goes back in time over and over again until he gets things right - but that is where the similarity ends. There are multiple storylines, each one fundamental to the outcome. I always enjoy a good time travel novel and “The Alexandrite” was a refreshing spin on a popular genre. In fact, it seems to span across the genres: murder, romance, mystery, definitely something for everyone. The characters, each one quirky and intriguing are genuine and relatable. I love the development of Jack’s character during his travels. In the beginning he just goes with the flow to see where the journey will lead. Then as time goes on, Jack takes ownership of matters and drives the outcomes personally. At this point, he is invested and does what is necessary to set things straight. The descriptive settings, especially of old Hollywood, are enchanting and I easily transitioned between the two worlds with Jack. The plot is fast-paced, a definite page-turner, keeping me guessing and intrigued to very last page. 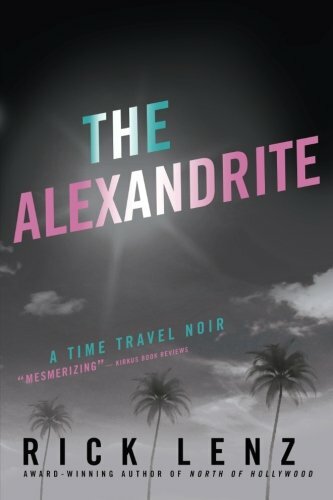 "The Alexandrite” by Rick Lenz is a must-read for all lovers of time travel, Hollywood, murder, mystery, and romance. It is a unique piece of literary work that has something for everyone.